This entry was posted in Edmodo, Opinion, Review and tagged challnege, Edmodo, education, social network. Bookmark the permalink. 7 Responses to Edmodo Challenge! I am on board for figuring it out. 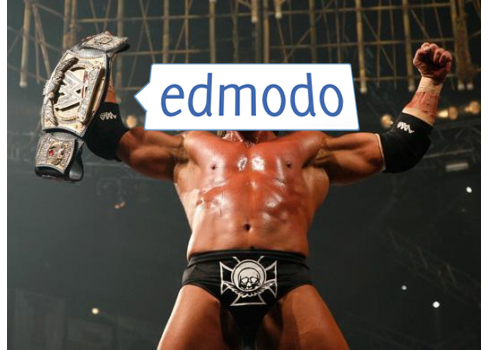 Biggest complaint I get from teachers is the process of moving info from edmodo to powerschool. Yeah, someone else mentioned that as well. With Edmodo, I know that you can export your grades as a CSV file. Is there a way to import that information into PowerSchool? Just an idea, I’ve never used PowerSchool before but it sounds promising. Your review of EDU 2.0 was great. Can’t wait to see what you say about Schoology. By the way, I haven’t had time to research how Edmodo integrates with SIS programs like Powerschool. Maybe you can enlighten me. Our school uses Powerteacher extensively, so it would be great if Edmodo could be integrated. Thanks for stopping by and leaving a comment. I’m not sure about integration between Edmodo and Powerschool but I can help look into it but my gut tells me there is no official integration at this point. As for the Schoology review I’ve already got it done! You can find it here. I’m working on a livebinder review next for the edmodo challenge. I’m suspecting that you may be right. I recently met online with one of the Schoology reps and he assured me that the two programs could integrate through API. When I mentioned this to our guy in IT, he was skeptical. He thought maybe Schoology might accept info pushed from Powerteacher, but not the other way around. I sent an email to Schoology but have not yet received a reply. Perhaps the rep is digging into it. If you hear anything, let me know. It would be great to have a one-stop shop for teachers and parents (especially). Having to check two, three programs for info turns a lot of people off. Well, off to read your review!